(Francisco Kjolseth | The Salt Lake Tribune) U.S. President Donald Trump is surrounded by Utah representatives at the Utah Capitol on Monday, Dec. 4, 2017, as he signs two presidential proclamations to shrink Bears Ears and Grand Staircase-Escalante national monuments. (Francisco Kjolseth | The Salt Lake Tribune) U.S. President Donald Trump is surrounded by Utah representatives at the Utah Capitol on Monday, Dec. 4, 2017, as he signs two presidential proclamations to shrink Bears Ears and Grand Staircase-Escalante national monuments. (Francisco Kjolseth | The Salt Lake Tribune) U.S. President Donald Trump greets supporters at the Utah Capitol on Monday, Dec. 4, 2017, after signing two presidential proclamations to shrink Bears Ears and Grand Staircase-Escalante national monuments. (Francisco Kjolseth | The Salt Lake Tribune) U.S. President Donald Trump, surrounded by Utah representatives looks at Sen. Orrin Hatch to give him the pen used to signs a presidential proclamation to shrink Bears Ears and Grand Staircase-Escalante national monuments at the Utah Capitol on Monday, Dec. 4, 2017. (Francisco Kjolseth | The Salt Lake Tribune) U.S. President Donald Trump is surrounded by Utah representatives at the Utah Capitol on Monday, Dec. 4, 2017, as he signs a presidential proclamation to shrink Bears Ears and Grand Staircase-Escalante national monuments. (Francisco Kjolseth | The Salt Lake Tribune) U.S. President Donald Trump surrounded by Utah representatives looks at Sen. Orrin Hatch before giving him the pen used to signs a presidential proclamation to shrink Bears Ears and Grand Staircase-Escalante national monuments at the Utah Capitol on Monday, Dec. 4, 2017. (Francisco Kjolseth | The Salt Lake Tribune) U.S. President Donald Trump is surrounded by Utah representatives and many others at the Utah Capitol on Monday, Dec. 4, 2017, as he signs the presidential proclamation to shrink Bears Ears national monument. (Francisco Kjolseth | The Salt Lake Tribune) Bruce Adams, right, Chairman of the San Juan County Commission has his hat signed by U.S. President Donald Trump at the Utah Capitol on Monday, Dec. 4, 2017, following Trump's signing of two presidential proclamations to shrink Bears Ears and Grand Staircase-Escalante national monuments. (Francisco Kjolseth | The Salt Lake Tribune) Speaker of the House Greg Hughes, pumps his fist after being acknowledged by U.S. President Donald Trump at the Utah Capitol on Monday, Dec. 4, 2017. President Trump signed two presidential proclamation to shrink Bears Ears and Grand Staircase-Escalante national monuments. (Francisco Kjolseth | The Salt Lake Tribune) Bruce Adams, right, Chairman of the San Juan County Commission has his picture taken with U.S. President Donald Trump at the Utah Capitol on Monday, Dec. 4, 2017, following the signing by Trump of two presidential proclamation to shrink Bears Ears and Grand Staircase-Escalante national monuments. (Francisco Kjolseth | The Salt Lake Tribune) Interior Secretary Ryan Zinke is acknowledged by U.S. President Donald Trump on stage at the Utah Capitol on Monday, Dec. 4, 2017, moments before signing two presidential proclamation to shrink Bears Ears and Grand Staircase-Escalante national monuments. (Francisco Kjolseth | The Salt Lake Tribune) U.S. President Donald Trump leaves the Utah Capitol alongside Attorney General Sean Reyes at the Utah Capitol on Monday, Dec. 4, 2017. (Francisco Kjolseth | The Salt Lake Tribune) U.S. President Donald Trump arrives at the Utah Capitol on Monday, Dec. 4, 2017, to sign an executive order to shrink Bears Ears and Grand Staircase-Escalante national monuments. (Francisco Kjolseth | The Salt Lake Tribune) Sen. Orrin Hatch, left, and Speaker of the House Greg Hughes, join U.S. President Donald Trump at the Utah Capitol on Monday, Dec. 4, 2017, moments before signing a presidential proclamation to shrink Bears Ears and Grand Staircase-Escalante national monuments. (Francisco Kjolseth | The Salt Lake Tribune) Rep. Mike Noel, R-Kanab delights in having his tie signed by U.S. President Donald Trump at the Utah Capitol on Monday, Dec. 4, 2017, following Trump's signing of two presidential proclamations to shrink Bears Ears and Grand Staircase-Escalante national monuments. (Francisco Kjolseth | The Salt Lake Tribune) Bruce Adams, left, Chairman of the San Juan County Commission and San Juan County Commissioner Phil Lyman, at right, convicted of leading a 2014 protest ride in Recapture Canyon pose for photographs with supporters at the Utah Capitol on Monday, Dec. 4, 2017. U.S. President Donald Trump is scheduled to arrive on Monday, Dec. 4, 2017. President Trump will be joined by Sen. Orrin Hatch and Interior Secretary Ryan Zinke to sign a presidential proclamation to shrink Bears Ears and Grand Staircase-Escalante national monuments. (Francisco Kjolseth | The Salt Lake Tribune) Invited guests arrive at the Utah Capitol as U.S. President Donald Trump is scheduled to appear on Monday, Dec. 4, 2017. President Trump will be joined by Sen. Orrin Hatch and Interior Secretary Ryan Zinke to sign a presidential proclamation to shrink Bears Ears and Grand Staircase-Escalante national monuments. (Francisco Kjolseth | The Salt Lake Tribune) Media crews set up at the Utah Capitol as U.S. President Donald Trump is scheduled to arrive on Monday, Dec. 4, 2017. President Trump will be joined by Sen. Orrin Hatch and Interior Secretary Ryan Zinke to sign an executive order to shrink Bears Ears and Grand Staircase-Escalante national monuments. (Francisco Kjolseth | The Salt Lake Tribune) Invited guests arrive at the Utah Capitol as U.S. President Donald Trump is scheduled to appear on Monday, Dec. 4, 2017. President Trump will be joined by Sen. Orrin Hatch and Interior Secretary Ryan Zinke to sign a presidential proclamation to shrink Bears Ears and Grand Staircase-Escalante national monuments. (Francisco Kjolseth | The Salt Lake Tribune) San Juan County Commissioner Rebecca Benally gets a tour of the podium before her scheduled speaking engagement at the Utah Capitol as U.S. President Donald Trump is scheduled to arrive on Monday, Dec. 4, 2017. President Trump will be joined by Sen. Orrin Hatch and Interior Secretary Ryan Zinke to sign a presidential proclamation to shrink Bears Ears and Grand Staircase-Escalante national monuments. (Francisco Kjolseth | The Salt Lake Tribune) Rep. Mike Noel, R-Kanab, greets Invited guests arriving at the Utah Capitol as U.S. President Donald Trump is scheduled to arrive on Monday, Dec. 4, 2017. President Trump will be joined by Sen. Orrin Hatch and Interior Secretary Ryan Zinke to sign a presidential proclamation to shrink Bears Ears and Grand Staircase-Escalante national monuments. (Francisco Kjolseth | The Salt Lake Tribune) Secret service and law enforcement keep an eye on the events surrounding the arrival of the U.S. President to th Utah Capitol as U.S. President Donald Trump is scheduled to appear on Monday, Dec. 4, 2017. President Trump will be joined by Sen. Orrin Hatch and Interior Secretary Ryan Zinke to sign a presidential proclamation to shrink Bears Ears and Grand Staircase-Escalante national monuments. (Francisco Kjolseth | The Salt Lake Tribune) San Juan County Commissioner Rebecca Benally gets a tour of the podium before her scheduled speaking engagement at the Utah Capitol as U.S. President Donald Trump is scheduled to arrive on Monday, Dec. 4, 2017. President Trump will be joined by Sen. Orrin Hatch and Interior Secretary Ryan Zinke to sign a presidential proclamation to shrink Bears Ears and Grand Staircase-Escalante national monuments. (Francisco Kjolseth | The Salt Lake Tribune) Invited guests and media arrive at the Utah Capitol as U.S. President Donald Trump is scheduled to appear on Monday, Dec. 4, 2017. President Trump will be joined by Sen. Orrin Hatch and Interior Secretary Ryan Zinke to sign a presidential proclamation to shrink Bears Ears and Grand Staircase-Escalante national monuments. (Francisco Kjolseth | The Salt Lake Tribune) Rep. Mia Love waves to visitors arriving at the Utah Capitol as U.S. President Donald Trump is scheduled to arrive on Monday, Dec. 4, 2017. President Trump will be joined by Sen. Orrin Hatch and Interior Secretary Ryan Zinke to sign a presidential proclamation to shrink Bears Ears and Grand Staircase-Escalante national monuments. (Francisco Kjolseth | The Salt Lake Tribune) Kirsten Rappleye, Chief of Staff for Utah Governor Gary Herbert, sets a white balance for the press ahead of the arrival of U.S. President Donald Trump to the Utah Capitol on Monday, Dec4, 2017. (Francisco Kjolseth | The Salt Lake Tribune) Invited guests arrive at the Utah Capitol as U.S. President Donald Trump is scheduled to arrive on Monday, Dec. 4, 2017. President Trump will be joined by Sen. Orrin Hatch and Interior Secretary Ryan Zinke to sign a presidential proclamation to shrink Bears Ears and Grand Staircase-Escalante national monuments. (Francisco Kjolseth | The Salt Lake Tribune) Bruce Adams, left, Chairman of the San Juan County Commission and San Juan County Commissioner Phil Lyman, convicted of leading a 2014 protest ride in Recapture Canyon pose for photographs at the Utah Capitol on Monday, Dec. 4, 2017. U.S. President Donald Trump is scheduled to arrive on Monday, Dec. 4, 2017. President Trump will be joined by Sen. Orrin Hatch and Interior Secretary Ryan Zinke to sign a presidential proclamation to shrink Bears Ears and Grand Staircase-Escalante national monuments. (Francisco Kjolseth | The Salt Lake Tribune) Rep. Rob Bishop speaks with the press as Invited guests arrive at the Utah Capitol as U.S. President Donald Trump is scheduled to arrive on Monday, Dec. 4, 2017. President Trump will be joined by Sen. Orrin Hatch and Interior Secretary Ryan Zinke to sign a presidential proclamation to shrink Bears Ears and Grand Staircase-Escalante national monuments. (Francisco Kjolseth | The Salt Lake Tribune) Utah Attorney General Sean Reyes and Rep. Mia Love gather with Invited guests arriving at the Utah Capitol as U.S. President Donald Trump is scheduled to arrive on Monday, Dec. 4, 2017. President Trump will be joined by Sen. Orrin Hatch and Interior Secretary Ryan Zinke to sign a presidential proclamation to shrink Bears Ears and Grand Staircase-Escalante national monuments. (Francisco Kjolseth | The Salt Lake Tribune) U.S. President Donald Trump is joined by Senator Orrin Hatch at the Utah Capitol on Monday, Dec. 4, 2017, to sign a presidential proclamation to shrink Bears Ears and Grand Staircase-Escalante national monuments. (Francisco Kjolseth | The Salt Lake Tribune) U.S. President Donald Trump takes the stage at the Utah Capitol on Monday, Dec. 4, 2017, to sign a presidential proclamation to shrink Bears Ears and Grand Staircase-Escalante national monuments. 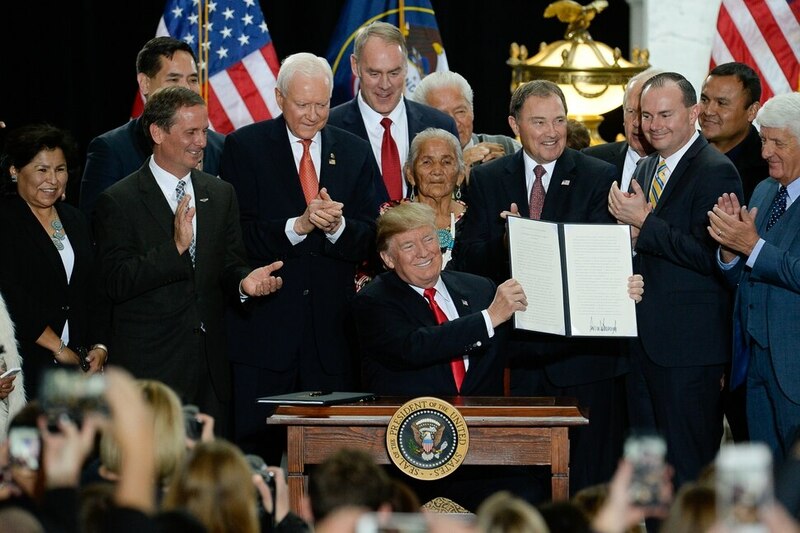 (Francisco Kjolseth | The Salt Lake Tribune) U.S. President Donald Trump takes the stage at the Utah Capitol on Monday, Dec. 4, 2017, to sign two presidential proclamations to shrink Bears Ears and Grand Staircase-Escalante national monuments. (Francisco Kjolseth | The Salt Lake Tribune) U.S. President Donald Trump takes the stage at the Utah Capitol on Monday, Dec. 4, 2017, to sign a presidential proclamation to shrink Bears Ears and Grand Staircase-Escalante national monuments. 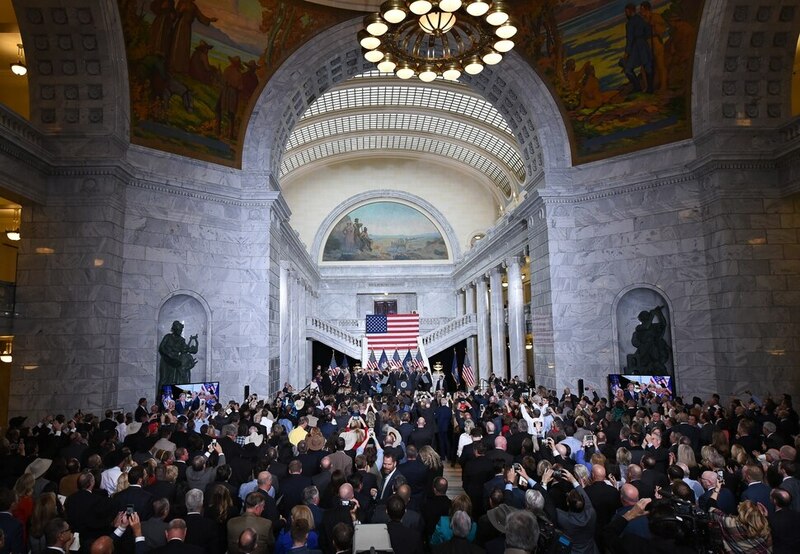 (Francisco Kjolseth | The Salt Lake Tribune) U.S. President Donald Trump takes the stage at the Utah Capitol on Monday, Dec. 4, 2017, to sign a presidential proclamation to shrink Bears Ears and Grand Staircase-Escalante national monuments. (Francisco Kjolseth | The Salt Lake Tribune) U.S. President Donald Trump points to Senator Orrin Hatch at the Utah Capitol on Monday, Dec. 4, 2017, prior to signing a presidential proclamation to shrink Bears Ears and Grand Staircase-Escalante national monuments. (Francisco Kjolseth | The Salt Lake Tribune) U.S. President Donald Trump takes the stage at the Utah Capitol on Monday, Dec. 4, 2017, to sign a presidential proclamation to shrink Bears Ears and Grand Staircase-Escalante national monuments. (Francisco Kjolseth | The Salt Lake Tribune) U.S. President Donald Trump takes the stage at the Utah Capitol on Monday, Dec. 4, 2017, to sign a presidential proclamation to shrink Bears Ears and Grand Staircase-Escalante national monuments. (Francisco Kjolseth | The Salt Lake Tribune) U.S. President Donald Trump is joined by Senator Orrin Hatch at the Utah Capitol on Monday, Dec. 4, 2017, to sign a presidential proclamation to shrink Bears Ears and Grand Staircase-Escalante national monuments. (Francisco Kjolseth | The Salt Lake Tribune) U.S. President Donald Trump takes the stage at the Utah Capitol on Monday, Dec. 4, 2017, to sign a presidential proclamation to shrink Bears Ears and Grand Staircase-Escalante national monuments. (Francisco Kjolseth | The Salt Lake Tribune) U.S. President Donald Trump is joined by Sen. Mike Lee at the Utah Capitol on Monday, Dec. 4, 2017, prior to signing a presidential proclamation to shrink Bears Ears and Grand Staircase-Escalante national monuments. (Francisco Kjolseth | The Salt Lake Tribune) U.S. President Donald Trump is joined by Sen. Mike Lee at the Utah Capitol on Monday, Dec. 4, 2017, prior to signing a presidential proclamation to shrink Bears Ears and Grand Staircase-Escalante national monuments. (Francisco Kjolseth | The Salt Lake Tribune) U.S. President Donald Trump takes the stage at the Utah Capitol on Monday, Dec. 4, 2017, to sign a presidential proclamation to shrink Bears Ears and Grand Staircase-Escalante national monuments. (Francisco Kjolseth | The Salt Lake Tribune) U.S. President Donald Trump is surrounded by Utah representatives at the Utah Capitol on Monday, Dec. 4, 2017, gives Utah Gov. Gary Herbert one of the pens used to sign two presidential proclamations to shrink Bears Ears and Grand Staircase-Escalante national monuments. (Francisco Kjolseth | The Salt Lake Tribune) U.S. President Donald Trump is surrounded by Utah representatives at the Utah Capitol on Monday, Dec. 4, 2017, after signing two presidential proclamations to shrink Bears Ears and Grand Staircase-Escalante national monuments. (Francisco Kjolseth | The Salt Lake Tribune) U.S. President Donald Trump is surrounded by Utah representatives at the Utah Capitol on Monday, Dec. 4, 2017, as he signs a presidential proclamation to shrink Bears Ears and Grand Staircase-Escalante national monuments. (Francisco Kjolseth | The Salt Lake Tribune) Bruce Adams, right, Chairman of the San Juan County Commission has his hat signed by U.S. President Donald Trump at the Utah Capitol on Monday, Dec. 4, 2017, following Trump's signing of two presidential proclamations to shrink Bears Ears and Grand Staircase-Escalante national monuments. (Francisco Kjolseth | The Salt Lake Tribune) U.S. President Donald Trump takes the stage at the Utah Capitol on Monday, Dec. 4, 2017, to sign a presidential proclamation to shrink Bears Ears and Grand Staircase-Escalante national monuments. (Francisco Kjolseth | The Salt Lake Tribune) U.S. President Donald Trump looks for acknowledgment from Utah representatives off stage while making remarks at the Utah Capitol on Monday, Dec. 4, 2017, prior to signing two presidential proclamations to shrink Bears Ears and Grand Staircase-Escalante national monuments. (Francisco Kjolseth | The Salt Lake Tribune) U.S. President Donald Trump is surrounded by Utah representatives at the Utah Capitol on Monday, Dec. 4, 2017, as he signs the presidential proclamation to shrink Bears Ears national monument. (Francisco Kjolseth | The Salt Lake Tribune) U.S. President Donald Trump is joined by Se. Mike Lee on stage at the Utah Capitol on Monday, Dec. 4, 2017, before the president's signing of two presidential proclamations to shrink Bears Ears and Grand Staircase-Escalante national monuments. To the cheers of Utah politicians and dismay of environmental and tribal groups, President Donald Trump swept into Utah on Monday and erased most of Bears Ears and Grand Staircase-Escalante National monuments — shaving 2 million acres from their boundaries and replacing them with five smaller monuments. The historic move was swiftly met with a lawsuit filed by a coalition of conservation organizations and threats of another from American Indian groups, as opponents claimed the reductions are illegal and denounced them as potentially opening pristine lands to development. Protesters along Trump’s route and in downtown Salt Lake City shouted and waved signs opposing his changes, and for a time halted traffic. Trump also used the three-hour visit, his first to Utah since becoming president, to tour Welfare Square, meet with leaders of The Church of Jesus Christ of Latter-day Saints, promise to protect religious freedom — and urge Utah Republican Sen. Orrin Hatch to seek another term, which might prevent a run by Trump critic Mitt Romney, a two-time presidential candidate. 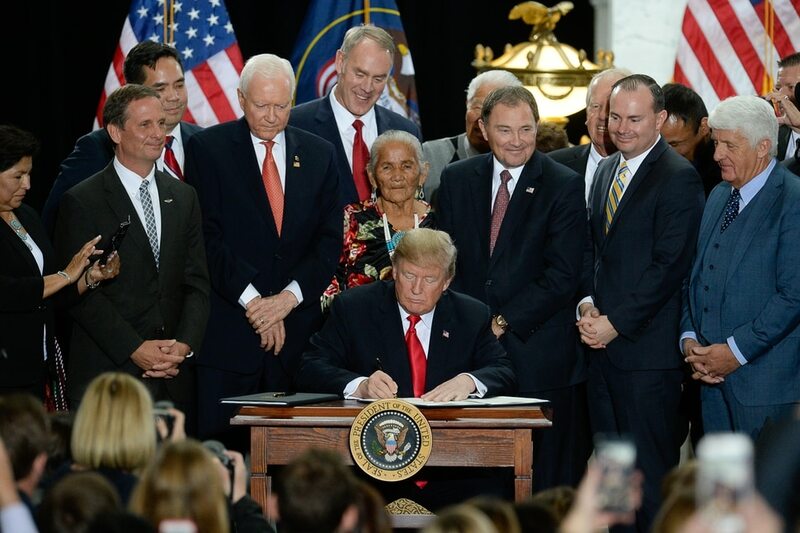 At the invitation-only Capitol Rotunda ceremony, he signed a proclamation to shrink Bears Ears, created last year by President Barack Obama, from 1.35 million acres to 201,876. The remnants were placed into two new monuments: Shash Jaa (Navajo for Bears Ears) at 129,980 acres and Indian Creek at 71,896 acres. He signed a second proclamation to reduce Grand Staircase-Escalante — created in 1996 by President Bill Clinton — from 1.9 million acres to 1 million. It was replaced by three monuments: Grand Staircase at 209,933 acres; Kaiparowits at 552,034; and Escalante Canyon at 242,836. The protected areas are still larger than Rhode Island. He said presidents are supposed to set aside in monuments only the smallest area necessary to protect important resources. Instead, he said, previous administrations put millions of acres into the monuments. “Some people think that the natural resources of Utah should be controlled by a small handful of very distant bureaucrats located in Washington. And guess what? They’re wrong,” Trump said to cheers. Zinke was ordered by Trump to review all monument designations back to 1996 and recommend changes to six monuments. While Trump’s action was decried by environmentalists and tribal leaders as the largest withdrawal of land protections in U.S. history, Zinke said the move was needed to fix the “two cases of abuse” of the Antiquities Act. None of the land removed from the former monuments will be sold or transferred, Zinke said; it will return to its previous status, as land managed by the Bureau of Land Management, wilderness or as a national forest. Congress should consider what additional designations make sense, he added, including the possibility of a national park in the region. However, for example, coal deposits in much of the Kaiparowits Plateau could be tapped. Clinton originally created the Grand Staircase-Escalante monument largely to prevent that. Raising the possibility of drilling and mining inside that monument’s former boundaries, 10 environmental groups filed a federal lawsuit in Washington, D.C., alleging the Antiquities Act does not allow presidents to diminish or rescind monument designations by their predecessors. The groups, including the Southern Utah Wilderness Alliance, said they aim to defend the former monument’s unique fossil record, its biodiversity and the landscape that has drawn tourists and invigorated southern Utah’s economy. “The Trump administration has ignored overwhelming support for the monument. It’s a punch in the face to local businesses who support it, and all of us who treasure it,” said Shelley Silbert, executive director of Great Old Broads for Wilderness. Other groups also are expected to file lawsuits, including the five tribes who pushed for monument status for Bears Ears — Hopi, Navajo Nation, Ute Mountain Ute Tribe, Pueblo of Zuni and the Ute Indian Tribe. Brian Sybert, executive director of the Conservation Lands Foundation, said the group plans to sue to stop Trump’s reductions. Zinke said the administration is on firm legal footing to change the boundaries, noting other monuments have been changed 10 times in the past. He also said he’s not concerned about a large increase in oil and gas exploration or coal mining. Bishop has filed a bill that would curtail a president’s power under the Antiquities Act, but so far has been unsuccessful in moving it forward.